Colombo’s skyline has changed dramatically in the last decade or so although the development process commenced even prior to the end of the civil conflict in mid-2009. Indeed, the commercial capital seems to have attracted interest from all and sundry in the light of its geographical appeal as a hub for trade, business and investment, as well as the amenities it now boasts. 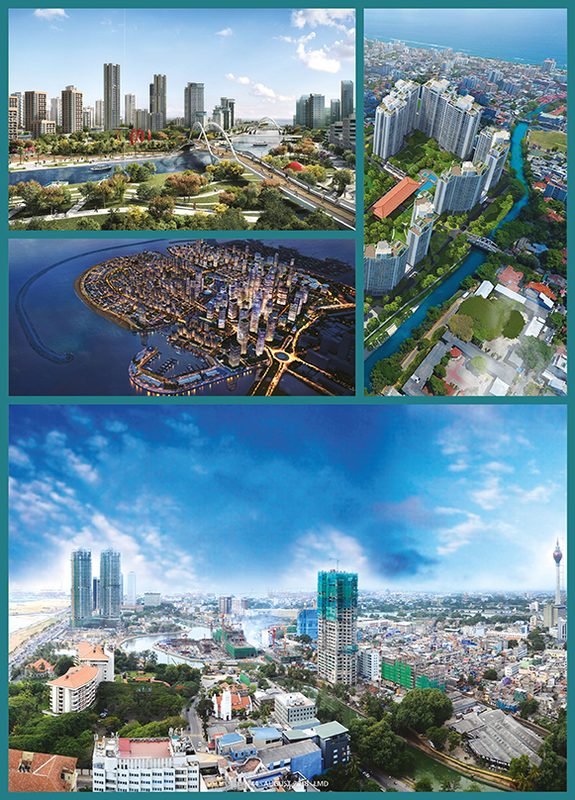 A number of property development projects in and around Colombo have already been completed. Meanwhile, many more are emerging before our very eyes, boosted by factors such as tourism industry growth, inward migration, an expanding middle class and the resulting urbanisation, and a call for real estate sector players to be ahead of others in the game. Some among the landed gentry have also opted to develop properties with a focus on vertical living, which has led to greater diversity in the city’s landscape. Be it in the form of residential apartments or houses, mixed developments, retail malls, hotels, offices or commercial property – and to cap it all, an extension to the city limits through the Port City (a.k.a. CIFC) – real estate has become one of the most discussed and debated sectors in business circles – particularly in relation to Colombo as well as the Western Province in general. Private sector participation in infrastructure, government policies with respect to foreign investment and affordable housing are among the factors that underpin growth across several categories of real estate in the commercial capital. At the same time, urbanisation, tourism and the development of the services sector are also driving the real estate market’s growth. While regional comparisons reveal positive metrics from a South Asian perspective, Sri Lanka’s development agenda does require the nation to accelerate progress with regard to infrastructure development. Colombo may even seek to emulate the likes of Singapore and Kuala Lumpur, which have reached such a phase of advanced property development that they tend to be considered First World cities today. In the latest edition of the Global Real Estate Transparency Index, Sri Lanka is ranked 66th out of 100 economies. This corresponds to an upward movement of three places from its ranking in 2016 when the island debuted on the index, which is compiled by global real estate consultancy Jones Lang LaSalle (JLL). The index quantifies transparency based on 139 variables relating to the transaction process, regulatory and legal frameworks, corporate governance, performance measurement and data availability – with higher real estate transparency being associated with stronger investor and corporate real estate activity. Its latest edition highlights the need to implement measures to maintain Sri Lanka’s momentum towards greater transparency in the real estate market. “Public-private partnerships (PPPs) are tremendous engines for increased transparency,” notes JLL Sri Lanka’s Managing Director Steven Mayes. He points to projects such as the Western Region Megapolis, CIFC and other developments that are to be financed through a PPP model. “Although the bulk of purchases of luxury condominiums, and some of the construction of office and hotel buildings, may reportedly rely on foreign financing, the increasing credit concentration in the real estate sector can lead to rising financial risks. If rapid construction leads to an oversupply in the real estate market, lower prices and a slowdown in construction activity would likely follow, and trigger stress among the often leveraged builders,” the IMF warns. Nevertheless, according to Chairman of Condominium Developers Association of Sri Lanka Pradeep Moraes, who delivered an address at the Sri Lanka Investment and Business Conclave 2018, apartments currently account for only 1.7 percent of Colombo’s residential facilities despite a scarcity of land to cater to rapid urbanisation. He disclosed that 90 percent of luxury condominium acquisitions are equity based and on average, 65 percent of purchases are by resident Sri Lankans, 27 percent by expatriate Sri Lankans and eight percent by foreigners. So while the government’s focus has primarily been and should continue to be focussed on drafting policy and developing supporting infrastructure, the private sector has seemingly dived into the business of realty in a bid to address market needs and perhaps even defy convention in the process.